INTERSECTIONS is part performance, part community-outreach, part public conversation, part investigation of the shared responsibility of a neighborhood. 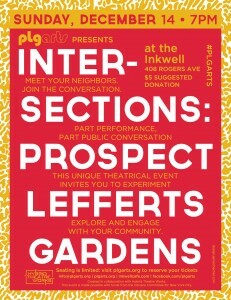 Using as a springboard the metaphor of intersections and crossroads, this project uses interviews of Prospect Lefferts Gardens residents to create a performance event which invites audiences to meet their neighbors and intersect with their community. $5 suggested donation ~ One night only! Seating is limited!